Ecuador was not in our original game plan, but we had a week left of our around-the-world tour, and spending it at the beach sounded perfect. Plus, if we made it to Ecuador, we would have 20 countries in 12 months. It was a perfect plan, but it would take us 46 hours of traveling from Huaraz, Peru, to our final destination of Puerto Lopez, Ecuador. We took an overnight bus on June 21st from Huaraz to Trujillo, arriving at 4:30 AM. Our next bus didn’t leave until 11:45 PM. So what does one do with a 19 hour layover? We tried to sleep in the bus station then started the long day of wandering around from café to café. Luckily, the main square was beautiful and clean, so we spent several hours people watching from the bench. The security is tight in this park, and I got in trouble for laying down for a nap! Shoe shining and sales pitches are also not allowed. However, the crazy guy in an oversized suit screaming about the government and lecturing about the banks was allowed! The surprise of the day was the friendly locals. 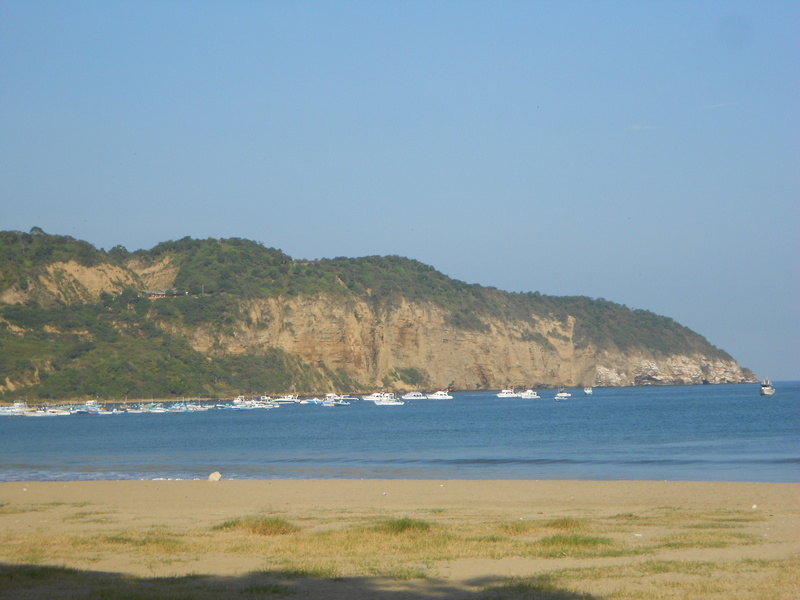 Everybody said, “Buenos Dias,” and smiled at us, which was quite the change from the reserved mountain people. At one café, the waiter sat down with us to practice his English as there were no other customers. Thirty minutes into our conversation, he poured us his fruit moonshine that he keeps behind the counter; it was potent but delicious! 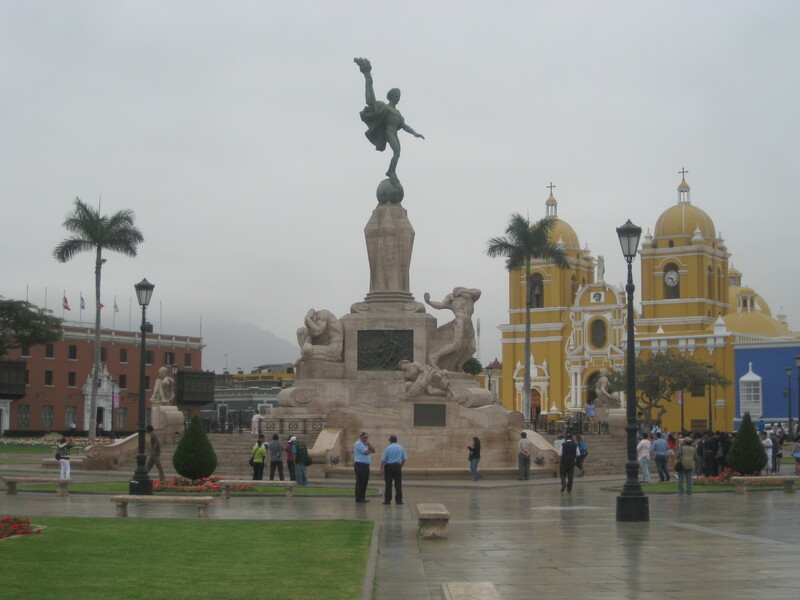 Finally, it was time to catch our bus to Guayaquil, Ecuador’s largest city. The bus ride was 19 hours but felt faster by good movies and comfortable seats as we had upgraded to first class. In Guayaquil, we transferred to the local bus to travel the final three hours to Puerto Lopez, our final destination. 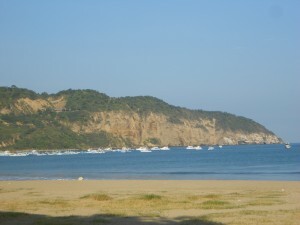 According to our guide book, Puerto Lopez is a small fishing village with a few good restaurants and access to Ecuador’s only coastal national park. When we arrived on Saturday night, the town was partying exactly what I was not expecting! The town was thumping as we wandered around trying to find a place to sleep. We got the last bungalow at the last hostel in town, and we quickly fell asleep even with the loud music. I felt like a human being again after a good night of sleep and was only slightly disappointed that it was overcast and drizzly outside. The day was spent exploring the tiny town, eating, and resting in our bungalow. Ecuador’s currency is US dollars, so it was a nice change not to have to do math in my head today. It was weird, though, because all those Sacajawea dollars that the US citizens rejected have made their way down to Ecuador! This town would be a great place to rest and get ready to head home where we would reintroduce ourselves into normal life, our families, and US culture. 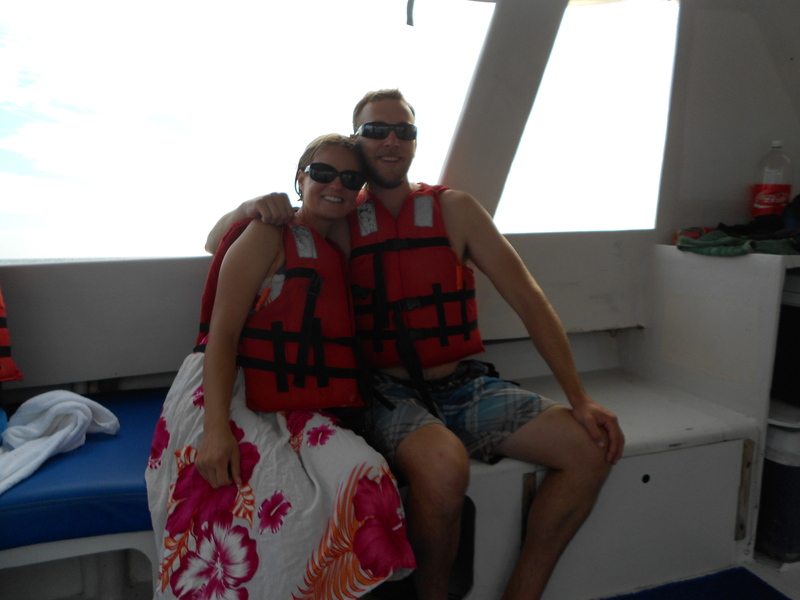 On June 25th, we took a tour to Isla de la Plata, an island off the coast and part of the national park. The island is called “Silver Island” because all the bird poop looks like silver plating. When the light is shined on it, it glimmers. No lighthouse is needed on this island! 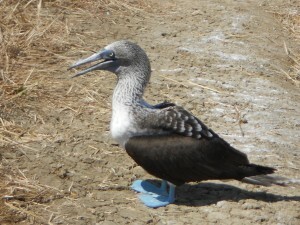 The island is famous for its bird colonies of blue-footed boobies and fragates. 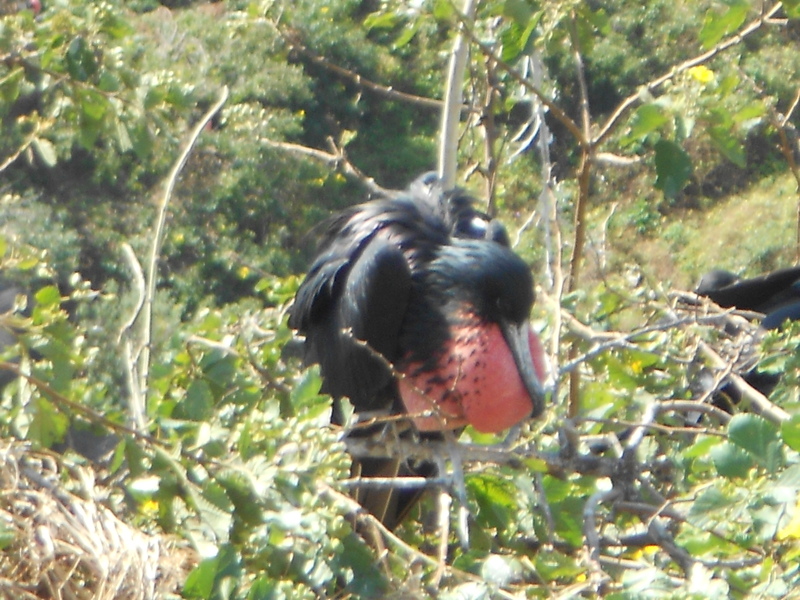 It was mating season, so we got to see the male birds at their finest. The male blue-footed boobies do a little dance and squawk to get the female’s attention. The male fragates puff out their brilliant red chests and wait on the branches for the females. 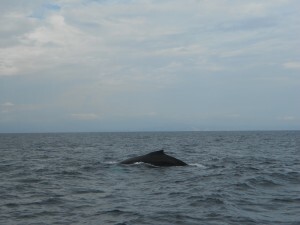 On the way back from the island, we observed a pod of humpback whales. We never saw them breech, but we saw lots of spouts, backs, and a few tails here and there. The whales were within 15 feet of our boat and I felt like I could almost touch them. 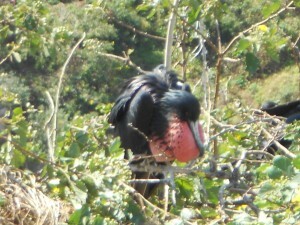 It was incredible and a definite wildlife highlight of the trip! The next two days were overcast and dreary, so we just hung out at the little café and went swimming between rain showers. We did have a pleasant surprise of running into our friends Jens and Doris from our Bolivian Salt Flat tour. It was so great to catch up with them and find out how their trip has been since we last saw them. 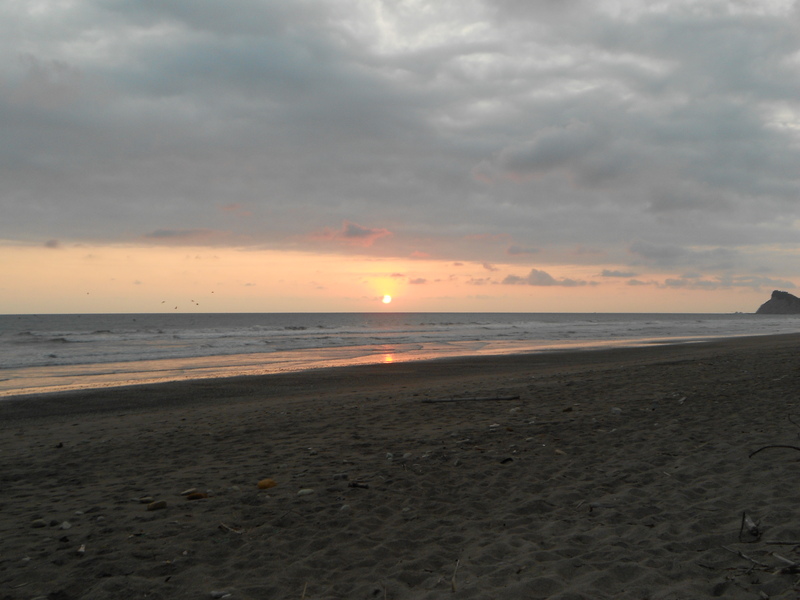 It was time to move on to Los Tunas, a little beach 20 km south of Puerto Lopez, on June 28th. We took the little local bus and got off at the eco-lodge, recommended by our guidebook, outside of town which ended up being closed. So we walked the 2km into town to find another place to stay. We found a great little B&B right on the beach with lots of hammocks. The B&B was owned by a Peruvian woman who got her masters in marine biology at University of Washington! It was sunny here, so we spent the day at the beach reading and swimming. The water felt like bath water, but there was a very strong undertow, so the swimming was limited. 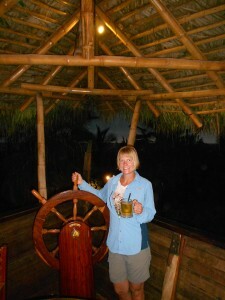 Los Tunas only has two restaurants and one is in the hull of an old wooden ship. The wood was gorgeous, and the place had a fun atmosphere plus the food was yummy! We continued our rummy tournament over a box of white wine. We only had a few days left to finish the tournament, and we were neck and neck! The next two days, we were blessed with sunny, warm weather so we spent most of our day on the beach or in a hammock in the shade. 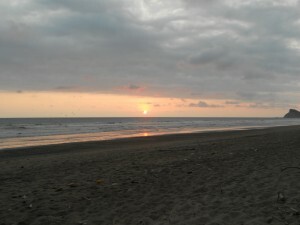 We also worked on a little yoga on the beach and played with our hostel’s dogs. The dogs were playful and loved to be chased around the beach. They also liked to chase the sand crabs and kept us entertained just watching them! Thanks for following us this year, Betse! We didn’t spend any time in Guayaquil, although it sounds like you have some great memories there…the Eiffel buildings and the shoe shine boys are probably still the same! 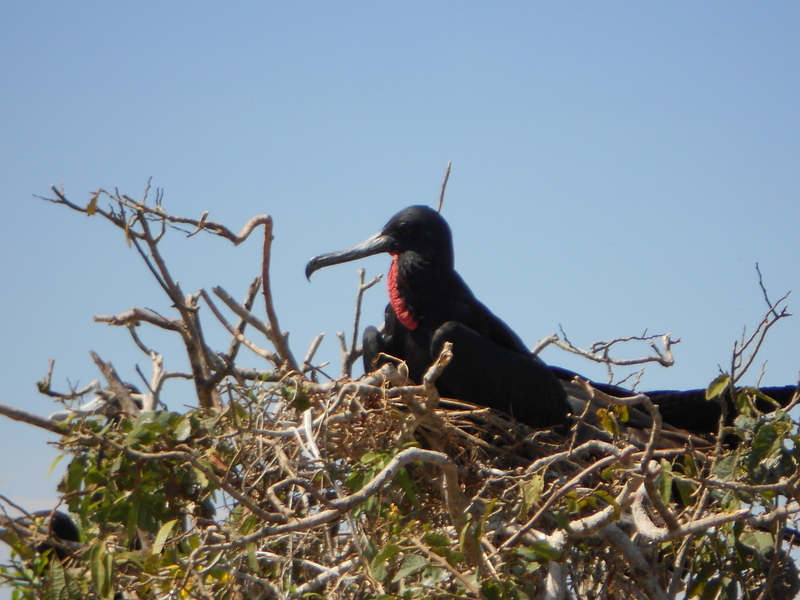 The beaches were amazing, and I really enjoyed the frigates and blue-footed boobies…I have become more interested in birds this year. Thanks for welcoming us back, and I hope things are good for you and David.